More than five years ago, I left corporate America behind and dedicated myself fulltime to writing and speaking on the Catholic faith. In many ways it has been a struggle to be sure, but God has always opened doors as needed, in His time, even as I went from a “conservative” Catholic writer with endorsements from Cardinals and Bishops, welcome in dioceses around the country, to a “traditionalist” pariah who creates consternation in chanceries just by being named a speaker at a local conference. Over the last several years, I’ve been in a very unique position… I’ve been able to earn a modest income freelancing for a firm creating fundraising and communications content for Catholic apostolates and other non-profits, even as I was able to dedicate considerable time and effort building (along with each of you) the Harvesting the Fruit blog. That’s over now, in part, thanks to our efforts here in defense of the Catholic faith. 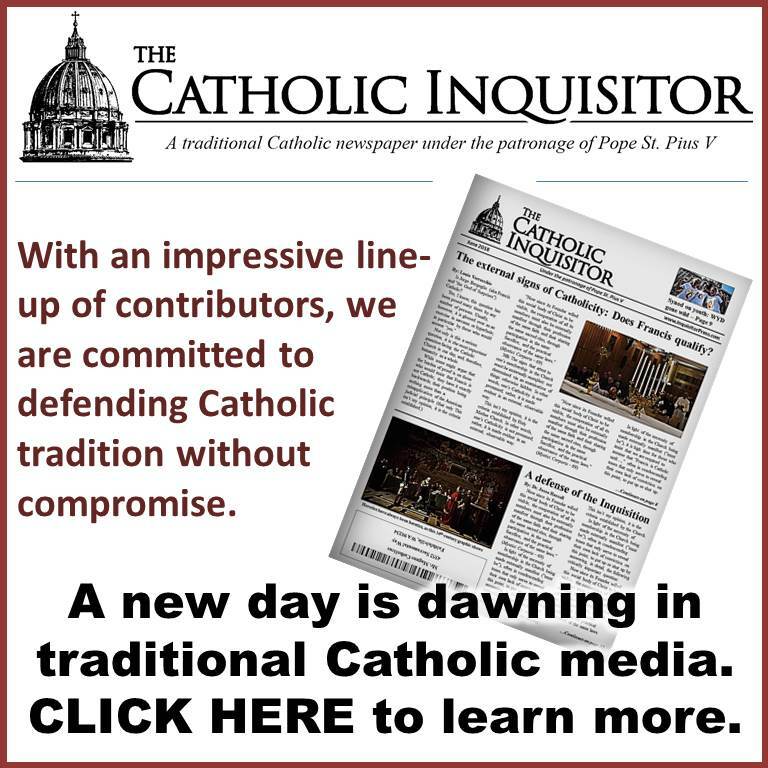 It’s not possible, without doing harm to those who stand with us, to provide all of the ugly details (so please, don’t even attempt any guesses), just know that there are bishops in the Church today who are willing to take concrete steps to prevent people like me from earning a living, simply because of the way I stand up for tradition. Nice, eh? – I suppose I could admit defeat and retract my well-founded criticisms of the Novus Ordo, the Council and the antics of Pope Francis and perhaps then find favor with some neo-con benefactor somewhere. NOT A CHANCE. – Or lastly, and in some ways the most difficult of all for me, I can humble myself and ask for your help in keeping this effort moving forward, which is precisely what I would like to do more than anything as I am fairly certain that the Lord didn’t bring any of us here just to pack it in now. This blog isn’t just my space; it’s yours as well. 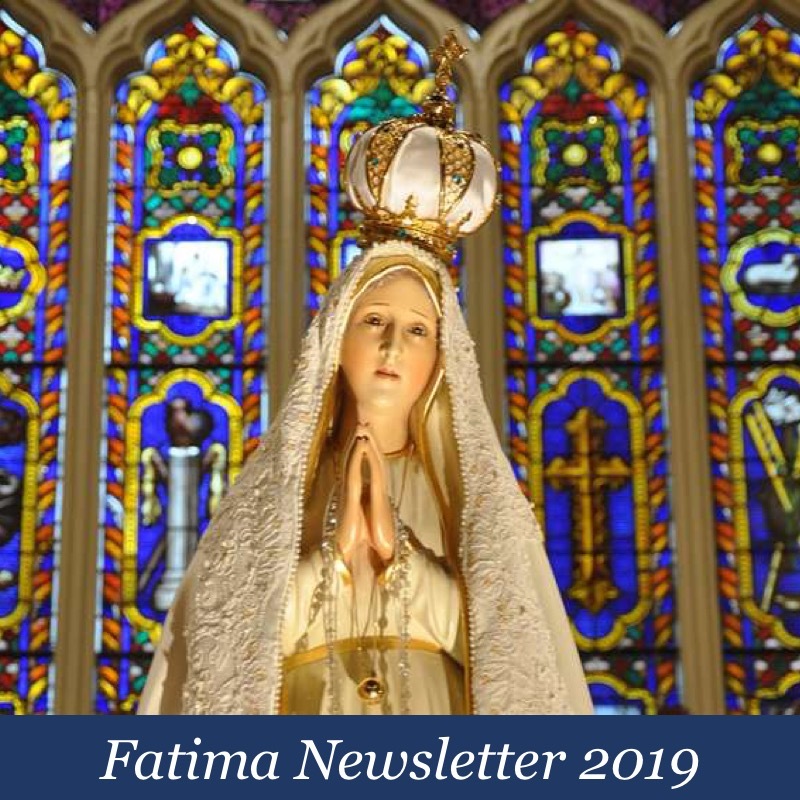 This is a place where faithful Catholics can share their knowledge and passion without fear of censure; it’s also a place for those seeking plainspoken truth to take it all in, and the fruits of our efforts are noteworthy. Heck, even Fr. Michael Rodriguez looks here for help in his own defense of tradition! You need to know that we are making a difference. On that note, I’ll limit myself to sharing just a few words that have come to me (confidentially) from priests and religious – and I mean “full communion” priests and religious who are laboring in the trenches. The above sampling comes to us from three diocesan priests, one religious order priest, and one religious monk representing three different countries. Imagine, these good men find comfort in what we’re doing. How incredible is that? I just looked at a 90 day snapshot of the blog’s traffic: 639,377 page views, by 51,940 users, from 158 countries. That’s over 2.5 million page views a year, and they’re not here just for me. There can be no doubt that the Evil One (and no small number of bishops) would like nothing more than for this blog to wither away, but it’s entirely up to us if it will. If you believe that the good that we do here, for yourself and for others, is worth supporting, please consider making a one time donation, or perhaps better still (for planning purposes) a monthly donation of $10, $20, $50 or any amount you may choose. Even just a few dollars a week can make the difference between this blog becoming a casualty of the war on tradition or not, and as difficult as it is for me to say, I need your help. For those who might ask: No, it’s not tax deductible, because frankly, I couldn’t afford to create a 501C! Maybe one day. I will, however, fast and pray for your intentions, and pledge to do my best to stay focused on our number one priority – seeking, finding, and proclaiming the truth (with an occasional dash of humor just to keep us sane) in the face of every attack, no matter from whence it comes. The links below will take you to a donation page where you can use either the credit / debit card of your choosing, or PayPal. You need not be a PayPal member: Just look for “No PayPal account?” near the bottom of the page. Il will support you louie spirtually and financially dont get your hope up though im not rich haha. 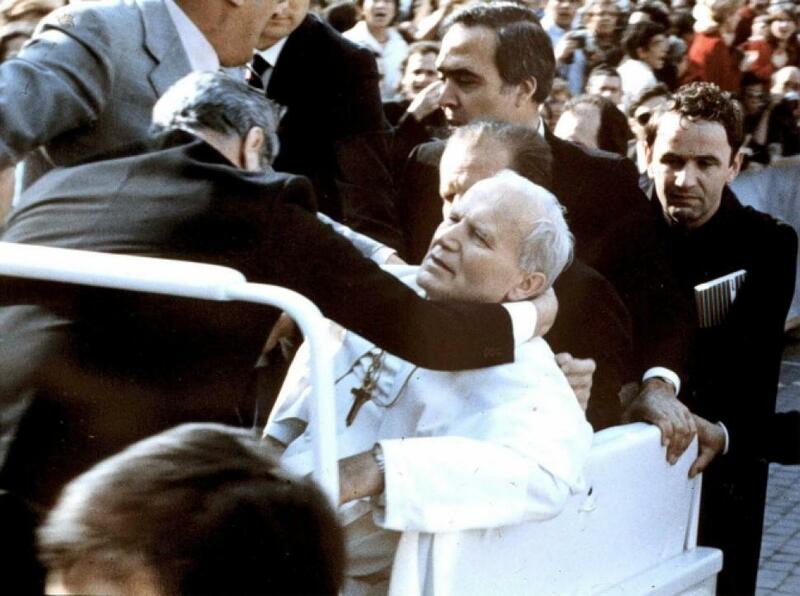 I knew the pressure would come on you the powers that be the enemy of holy mother church dont want you helping catholics and non catholics to find the truth of whats going on in the church. The enemy has showed it hand now expect alot pressure to be put on you. Just a thought louie the enemy may well try to buy there way in in order to gain favour and then use this against you. if all of a sudden big donations start coming in be very carefull. Only a thought but I think best all round would be if lots of readers donating each month made a sustainable amount throughout the year. If people start offering buildings etc they may well think there buying a controlling % in your blog. I had this exact same thought. Let’s all make small monthly sacrifices to support Louie so he doesn’t find himself under pressure from a big donor – like another fellow we all know. Thank you for letting us help – bring on that lottery win! Just made my donation and GOD willing will do the same each month on this date. I got lots of money. You shall have some of it. They shall have none. Some people may prefer to send checks, or cash. I will not offer to buy you for one warehouse in Detroit. But I’ll cough up some scratch. Commenters: keep up the good work. You guys raise the game. You have my prayerful support. You are right to ask for help. God will show the way – even if it’s through suffering. Many of us have suffered professionally and economically as well as in other ways for refusing to cooperate or compromise with evil, for refusing to relinquish the truth in Faith and morals. In fact, there are very few areas of professional or business life now where a true Catholic (who doesn’t confine the Faith to Sunday’s or “private life”) is not being persecuted either directly or indirectly, even if only in the negative sense, of not getting the job, the contract, the promotion, etc., tha they would otherwise get. The thing is, the more of us who would stand up for the moral truths, the harder it would be to persecute us. But what one funds, is that those who one might have hoped would support one, not only fails to do so, but colludes with the persecutors. And as we all know, that includes very many bishops and priests too. We are a tiny remnant but the people such as yourself who are in the public eye are a vital torch of inspiration, hope, courage and consolation. Let us rejoice (spiritually) in our share of suffering and pray and work for an increase in our ability and willingness to suffer, even unto the most extreme forms, which many of our brothers and sisters in Christ are undergoing in many places. May all the martyrs and saints intercede for consolation and perseverance on the part of those who are being killed, tortured, and suffering great cruelty and hardships for the Faith or upholding moral truth. Dear Lord, help us to grow in the virtues we need to yearn to glorify you regardless of the temporal consequences. Yes, I will contribute. Catholics with the means to spare a few dollars periodically (i.e. the vast majority of us – let’s be honest) SHOULD allocate a certain amount for regular contributions to online authors/publications. The circumstances of the Church in the 21st century demand no less from us. The fight for the soul of the Church is largely on the internet. 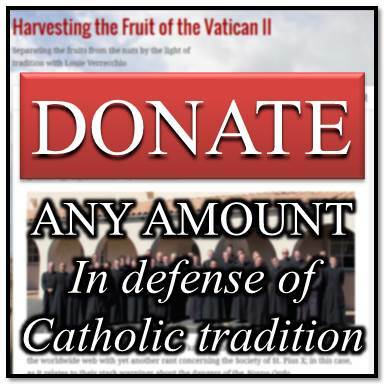 Catholics have a tendency to hem and haw when approached for contributions by even the worthiest of apostolates. I see it time and again. It’s really pathetic. Who presumes that any grown adult with the usual burdens of finance and time has the luxury of consistently producing thought-provoking content on critical matters without compensation? I’ll tell you who. A lot of Catholics. For starters, if you’ve got two pennies to rub together, and you regularly comment on Louie’s posts like it matters to you…well then, you see the donation links. Make ‘em repeating so long as you tune in. let’s attack the conciliarists where it hurts the most: IN THEIR POCKETS. Instead – let’s put our money where our mouth is and support worthy causes like Louie’s! 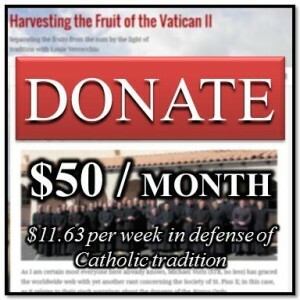 We need to deprive the conciliarists of the “food” which maintains the beast alive – our weekly contributions in the pew, and put that cash into more worthy, truly CATHOLIC causes! Louie, you left your corporate job to promote and defend the Catholic Church. Now if only our Bishops and Cardinals will do the same. I don’t see that coming any time soon. Therefore, you must stay on THIS job and it is our privilege and responsibility to help you do so. God bless you and your family. Great work Louis. God will provide. No doubts. Louie, you have been a blessing to me and I will support you as best I can. Just sent in a donation and will keep you in my prayers. Since I first “discovered” you on CMTV my faith has unfolded just as yours has. We all are on this journey together. Thanks for all your work and God bless you and your family for all the sacrifices you are making to combat error. You have written my sentiments exactly, Brigitte of Sweden! Mr. Verrechio, your blog is a breath of fresh, clean Catholic mountain air. You hold a special place in my heart particularly for your vigorous and constant defense of the dogma of Christ the King, which heretics like George Weigel laugh to scorn. After the outrageous 8/20 video on CMTV, I promptly cut off my subscription. You can now count on my regular contribution to your blog as can the Remnant Newspaper. God love you. Fortes in fide. Yes, ocalatrad, this blog is like a breath of fresh air. Did you know you could still receive CMTV’s daily “Vortex” without subscribing? My husband and I stopped our monthly donations when Mr. Voris began attacking by name Mr. Vennari, Mr. Matt, and company. I feel like in high school and the yearly raffle ticket selling. B/t/w, what is our monthly goal? Just as an FYI, when you donate, avoid paypal. They are on Life Decisions International boycott list as financial supporters of planned butcherhood / abortion. I just donated through paypal before I read your warning. How else should we donate? me too. so what do I do? Is there another option similar to Paypal? Like another poster said, if Louie provides a P.O. Box, I can send a check every month instead. Dear Louie, As soon as the Synod is over, I will cancel my CMTV subscription and send you a monthly donation. 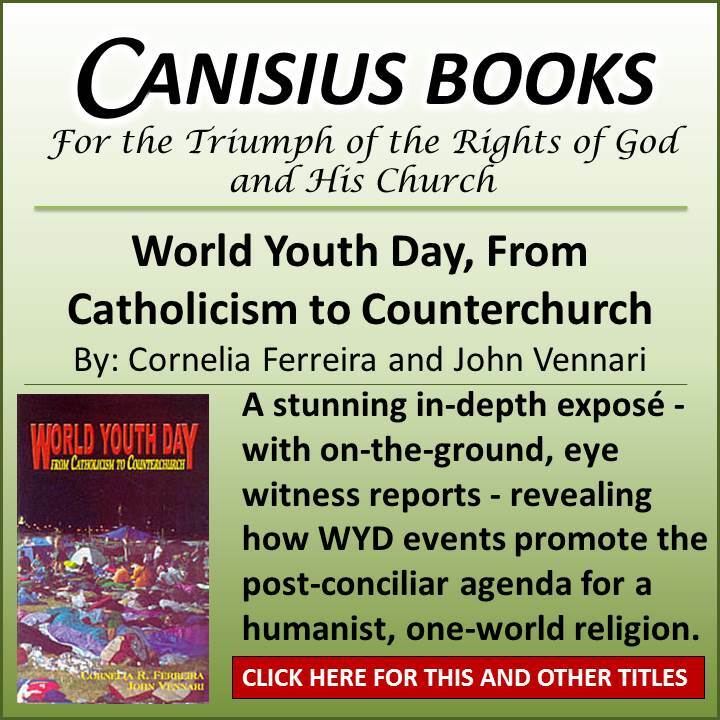 I am interested in seeing Mr Voris’ response to the Synod–a guilty indulgence fersher. Thank you, Frank for making me aware of Paypal’s coziness with the EVIL Planned Parenthood. Will cancel my account with them! Will donate to your cause immediately as well, Louie. May Our Beautiful Lady Swath You in the Safety of Her Mantle. Ahh…it has hit home. We are on a single income, but I will support you 5 bucks monthly! It’s not much, but if everyone could just donate what they can…it will add up! I chose the “any amount” button and made the amount lower and clicked the “monthly” box. Commentors! Please, anything will help. Let’s keep Harvesting the Fruit going! John 15:18-21 18 If the world hate you, know ye, that it hath hated me before you. 19If you had been of the world, the world would love its own: but because you are not of the world, but I have chosen you out of the world, therefore the world hateth you. 20Remember my word that I said to you: The servant is not greater than his master. If they have persecuted me, they will also persecute you: if they have kept my word, they will keep yours also. 21But all these things they will do to you for my name’s sake: because they know not him who sent me. Thank you Mr Verrecchio for this space, it is far more effective than you can know. Please have peace and courage in Christ Jesus, He will protect you always. St Athanasius – pray for us. St Michael the Archangel- protect us. Mary Most Holy- intercede for us. Readers and commenters – donate now please! Great quote from the Scriptures! Let’s all pray for Louie and this blog. Be assured of our prayers and donations for the wonderful work you are doing. My family have all attended SSPX masses since the early 80’s. I was confirmed by the Archbishop in Detroit. It has always saddened me that he has been so maligned by so many. Thank you for your defense of the Society and the Archbishop. I recently had a conversation with a young coworker of mine who knows I’m traditional and has always been inquisitive about it. She is so young and has had no exposure to tradition yet she is so obviously hungry for it. She doesn’t like the things the pope is saying about marriage and homosexuality. She is desperate for knowledge yet doesn’t know where to get it. This saddens me but also gives me hope – that a very young woman born well after the end of Vatican II should be attracted to something she has never even seen! God is merciful and bountiful in grace! I know your blog is a light in the darkness for others like her. Thank you for your work. God bless you! I am a corporate and tax lawyer who would be happy to provide you pro bono all the work you need to get a nonprofit up and running and qualified under 501(c)(3) to receive deductible donations. I live in Pennsylvania less than an hour from Baltimore, so it would be easy enough for us to meet and work out the details of the project. Let me know if you’d like to pursue this. Louie I have no suggestions to improve the blog but just want to make an observation. You said somewhere before you never need to remove any comments so far. And occasionally I see some comments that support Vatican II and heresy of modernism. I think it is a good idea to keep doing what you do, leave them alone so other commentators can respond. It just means some souls need our help to see the truth. 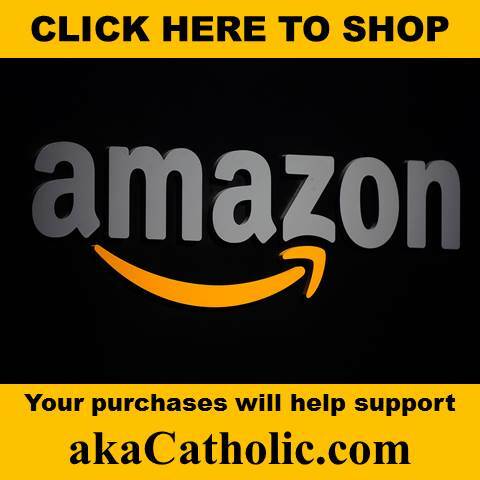 In fact I would suggest maybe you can provide some external links so someone (unlike most who comment here) who is still trying to figure out Vatican II can get some help in the basics. I would recommend Fr. Hesse’s comments on errors of Vatican II posted on Youtube (that was what turned me around on Vatican II, for example, Muslims and Catholics together worship the same God, LG 16) Maybe other readers can comment on other sites and materials that can help those who know only the basics of Catholic faith to have a better understanding of Vatican II. Also Louie is it possible or in your judgment better to switch to a platform that is similar to the Remnant or CMTV on the comment box(Disqus?) so people are automatically signed in and follow up comments would show up in their email inbox? I think switching the comment section to something like “Disqus” would make a great improvement to the comment section. I think the system of commenting on Mr Verrechio’s site is much better than Disqus (which I really dislike). The current system means any commenter has to first register with the blog – I think that is good and necessary to help limit malicious or frivolous comments. It means the comments are more likely to be sincere. I don’t think anyone should be able to comment unless Mr Verrechio has decided to allow him by accepting his registration.